Morning! Again we are at the end of the week and I am sure many of us are looking forward to the weekend. 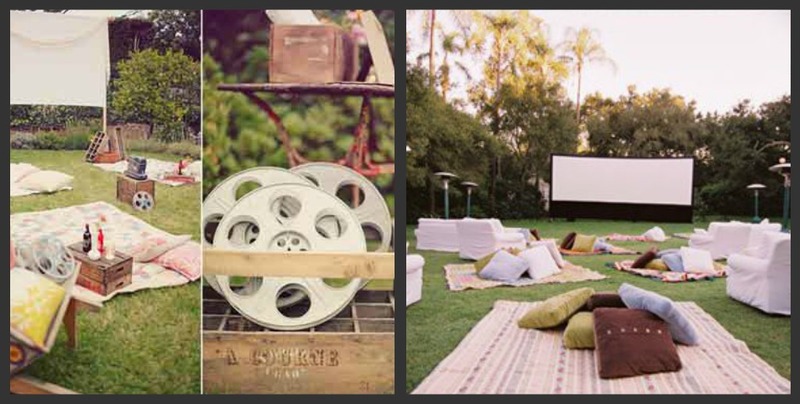 Today I would like to share some inspiration for a Movie Night party theme. Firstly it is important to choose the movie as this may have some bearing on your styling, eg Star Wars, Disney Princesses. Yet you might just like a more general movie theme with a red carpet entrance and a rope tacked across the door to the ‘cinema’ and a sign on the door saying ‘Now Showing’. Comfortable seating is a necessity and plenty of it too. Don’t panic if you only have a large sofa, bean bags or large cushions can work or line up rows of dining chairs to make rows like a cinema. Games can also be played before or after the movie. Maybe a game of charades, or a film trivia game or even movie bingo. A prop box would make for a fun movie themed photo booth, letting guests dress up as movie stars. Of course popcorn must be served and perhaps hot dogs too. Serve plain popcorn in bags that can then be seasoned from sugar and salt shakers or maybe Parmesan or dried herbs aswell. Alternatively have large serving bowls with different flavoured popcorn in each bowl for guests to choose their favourite flavours. A sweetie bar would also be fun or serve ice creams for an old fashioned styled ice cream sellers tray. Why not print pretend money for guests to buy their treats! So close the curtains, dim the lights, the movie is about to begin.